Be Blue is born this 2018 from and for Formentera with the aim of protecting and raising awareness about the environment. It also arises, to make us known the fragility of our maritime environment in the islands of Ibiza and Formentera. 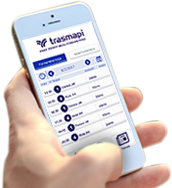 The Trasmapi shipping company wants to be part of the change by starting to raise awareness of the importance of responsible use of plastic due to its impact on the sea. In this sense, many of the actions that will lead this year have already been launched, such as the renewal of its fleet by more sustainable vessels, the implementation of bins that allows the recycling of the different waste; or lead collection campaigns on beaches and the seabed. The Mediterranean Sea gives our islands a great added value to our visitors. Today more than a million fragments of plastic per kilometer sail and dive without direction in its waters, altering the ecosystem. Immerse yourself in the Be Blue philosophy and make the change begin with you.